The Leinster indoor juvenile championships were held last Saturday and Sunday in Athlone. We had a great turnout from the club on both days and all of our athletes competed very well in both track and field events. On Saturday Orla Hayes, Emma Coroner, Kate Smith, Mark O’ Reilly, Karen Hayes, Shauna Coffey, John Redmond, Kritsada Cooke and Lara Power made the trip to Athlone. The competition this year was of a very high standard with big numbers entered in all the events. John Redmond and Lara Power competed in the u13 shot putt, John threw 7.99m, finishing 5th overall, while Lara threw 7.80m and finished 9th overall, a good result for their first Leinster competition. 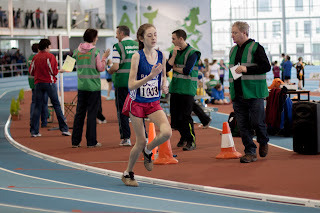 Shauna Coffey and Karen Hayes competed in the girls U13 600m, Karen was unlucky not to make the final finishing 4th in the heat, while Shauna finished 7th, Shauna also competed in the high jump, jumping 1.15m finishing 8th. The hurdlers were up next with Orla Hayes, Kate Smith and Emma Coroner competing in the girls u12 60m hurdles, Orla was unlucky not to make the final after finishing 2nd in her heat, her heat was re ran again due to timing problems and she finished 4th in the re-run. Kate ran well but did not make the final; Emma Coroner qualified for the final, but unfortunately missed it. 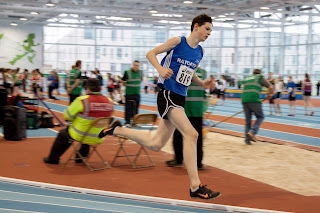 The two performances of the day came from Matthew Buckley and Kritsada Cooke, Matthew qualified easily in his heat of the u12 Boys 60m hurdles, and put in a great run in the final finishing 2nd in a time of 10.64 earning him his first Leinster medal. 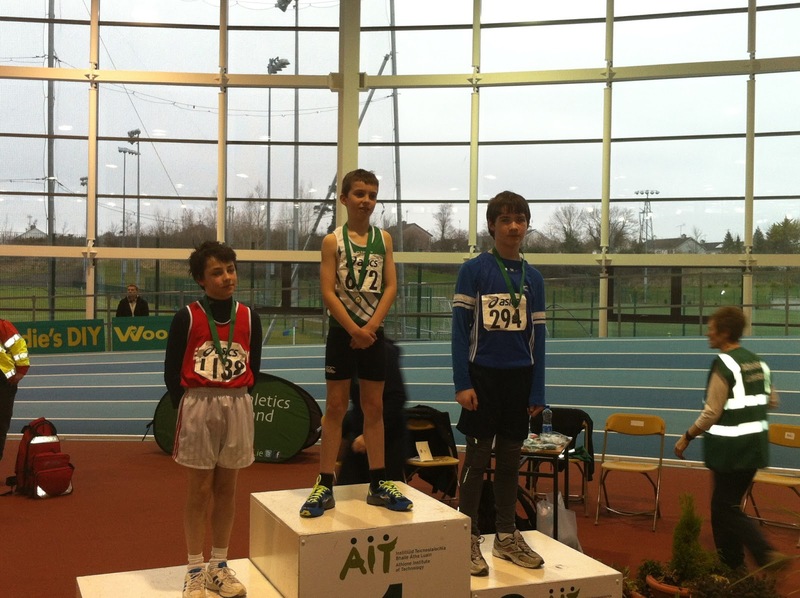 Kritsada Cooke only managed to qualify for the boys U13 60m hurdles as a fastest loser, but put in a storming run in the final to finish 3rd in a time of 10.64s, this was also Kritsada’s first Leinster medal. Kritsada also competed in the high jump, and jumped 1.25m finishing 8th. 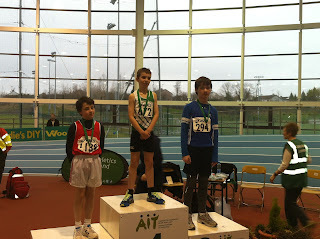 Mark O’ Reilly also competed in the boys U13 Hurdles and put in a good run. A big thank you thanks to Kieran Walshe and Richie Smith who helped out on the day. 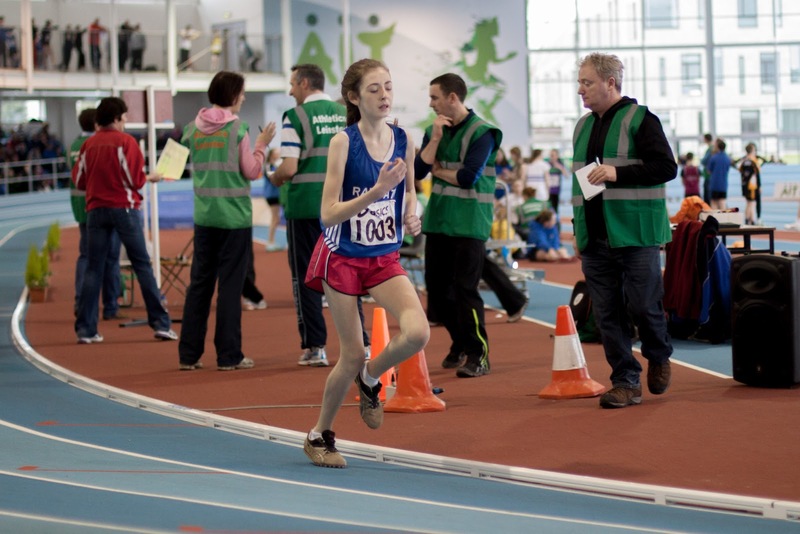 On Sunday our middle distance athletes and sprinters travelled to Athlone, the middle distance races were up first with Aine O Connor and Amber Roche competing in the girls U15 & 16 800m respectively, both girls ran well, but did not make the final. 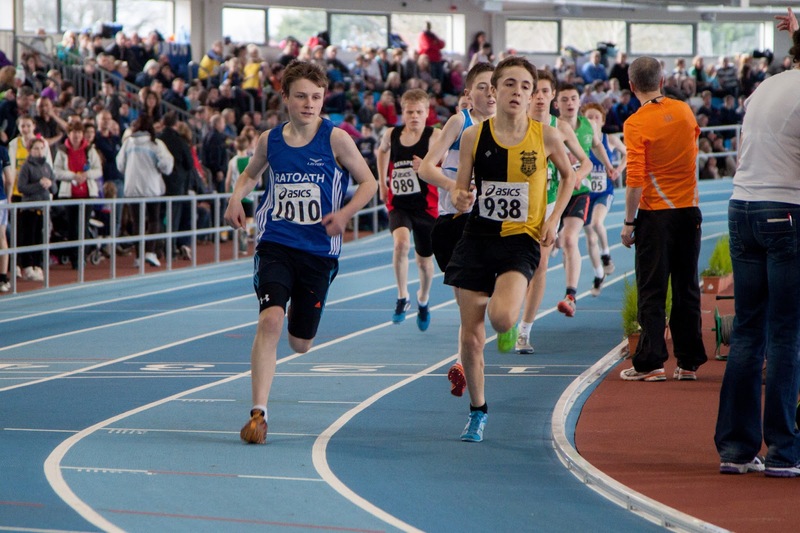 Alex Hunter, Peter Kilgannon and Ciaran McCarty competed in the boys U15, 16, & 17 800m respectively, all qualified out of their heats for the finals. 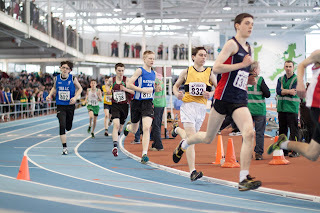 Alex finished 6th in the final in a time of 2.20.91, Peter finished 9th in a time of 2.21.88, his heat time was 2.17.6, and Ciaran finished 7th in a time of 2.18.62. 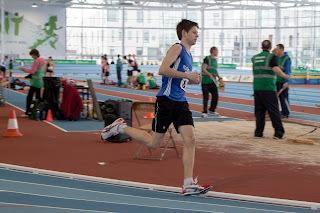 Conor Duncan competed in the boys u19 800m, and finished 3rd in a time of 2.12.66, a new indoor pb for Conor. 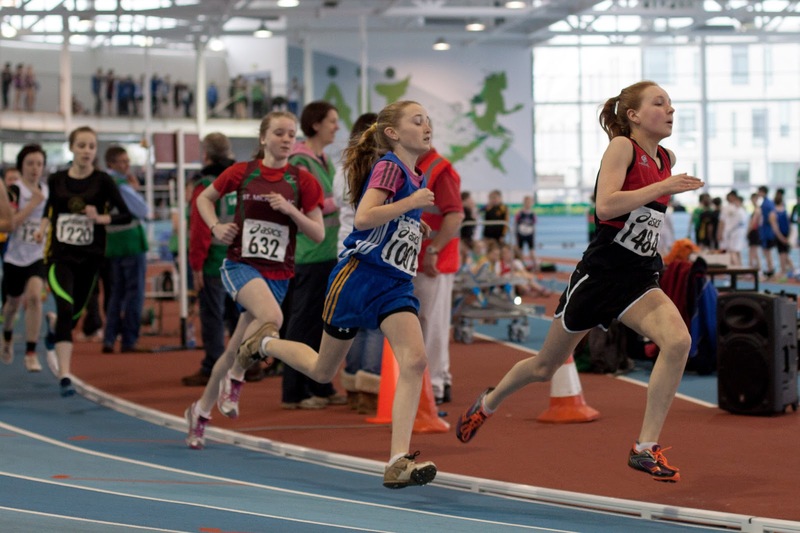 Next up was the 60m sprints, Emma Coroner , Orla Hayes and Rachel McPartlin competed in the girls U12 60m, Rachel and Emma qualified for the semi-finals, while Orla just missed out on qualification by 100th of a second. Rachel did not make it out of the semi, but put in a good run, her best time on the day being 9.58s, Emma made the final and finished 7th; her best time on the day was 9.13s. 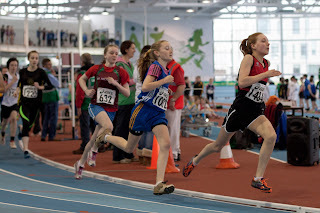 Aine Cooney and Ivie Okome won their heats easily in the girls U13 60, Aine ran a time of 9.01s, but did not make it out of the semi-final, Ivie won her semi-final also and put in a very strong run in the final finishing second in a time of 8.41s, the standard in the girls 60m this year was incredibly high, the winning time was 8.32s. Owen Clayton and Mikey O Malley competed in the boys U16 60, this was their first competition, both finished 4th in their heats, but missed out on qualification. Joey Wallace put in a good run in the boys U19 60m final, finishing 4th in a time of 7.56s, which was a new pb for him. Thanks to Gerry Finnegan and Siobheal Cummins who helped out on Sunday, and to all the parents who travelled on both days. 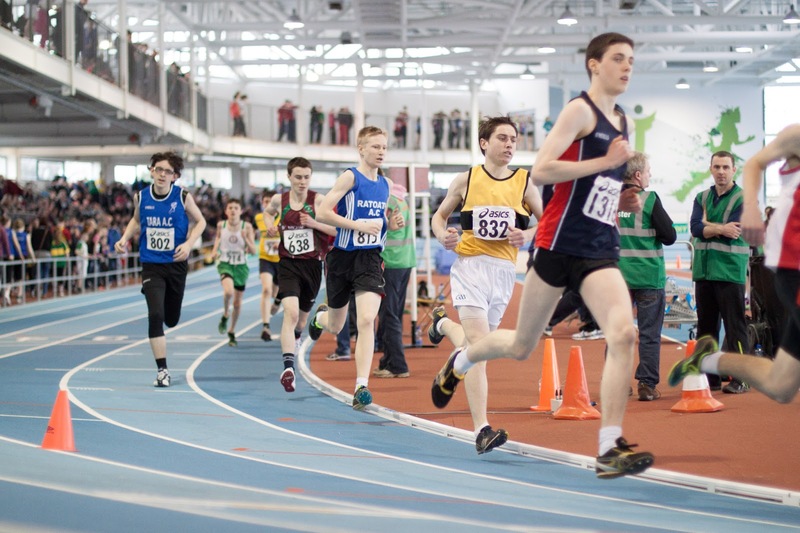 Best of luck to our athletes who have qualified for the All Irelands.